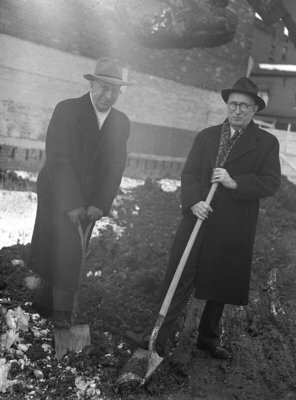 Black and white negative showing William McIntosh Pringle (Chairman of the Public Utilities Commission; left) and William Davidson (Mayor) turning the sod for the new building of the Public Utility Commission. The Public Utilities Commission office is located at 128 Brock Street South. Public Utilities Building Construction, 1948, Marjorie Ruddy. Whitby Archives, 08-006-059.